The announcement of a grandchild on the way is surely one of life's greatest moments. After years of child rearing, being able to enjoy a few grandkids is something many people hope for as they get older. Carolynn Pease got a whole lot more than she expected when she arrived at her son and daughter-in-law's house in Utah, having travelled from Montana, more than 1200km away. Greeted by her son Tannin and two grandchildren, Cooper, 4, and Gray, 2, she is filmed walking through the front door. After she gives little Cooper a kiss, her son says, "Hey Mum, we have a surprise for you." Tannin's wife Katie then emerges from the hall, her full term pregnant belly on show - surprising Carolynn with the news that their third son is on the way. But the shock doesn't begin and end there. It turned out Katie would be induced the very next day, on Carolynn's birthday of February 19. Speaking to ABC News, the couple said they had experienced two miscarriages after the birth of their second child and when they fell pregnant again, they decided to keep the news under wraps, saving the surprise for an opportune moment and only telling Katie's immediate family and a couple of friends. Katie says it was the hardest thing to tell people then have to inform they had lost their babies. "That was heartbreaking and we didn't want to have to go through that again, so it helped waiting so long," she said. Of his mum's reaction, Tannin says she was "speechless". "You see it in the video but ultimately, it was better than I expected. I thought she was going to hit me, but she turned around and hit my dad and kind of laughed it off." The couple went to great lengths to keep the pregnancy a secret, making sure all Facebook post approval settings were activated, with Katie staying indoors more and wearing concealing garments. Katie's belly was expertly hidden during their frequent Skype calls with Carolynn, where they made the two kids the focus. But Tannin's dad was in on the surprise, having learnt of the pregnancy when Katie was five months along. 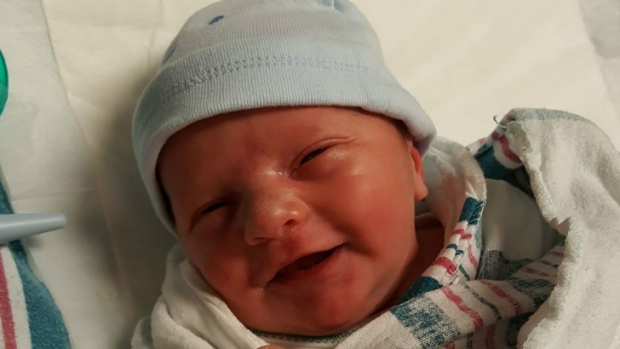 Baby Saul Pease was born on February 20 after the scheduled induction. Tannin says that his mum thinks Saul is "the best birthday present she's ever had", but that she's wise to it now. "I'm on alert," she joked to ABC News, letting her kids know this is one grandma who won't be fooled again.